"Your volunteer service demonstrates the kind of commitment to your community that moves America a step closer to its great promise." William L. Loveland, “Bill,” was born and raised in central Ohio, and has practiced law in our community since 1982. A 1973 graduate of "The" Dublin High School, he earned his undergraduate degree from Denison University in 1977. After graduating from Denison University, working in construction, and taking graduate school classes, he was admitted to law school at The Ohio State University College of Law. He received his JD from OSU, with honors, in 1982, and has practiced law in our great community ever since. Bill is currently the owner of Loveland Law, LLC. During his 33+ years of practice, he has represented companies, governmental entities, and individuals in real estate transactions, development planning and implementation, and litigation. Bill is rated as an AV lawyer by Martindale Hubbell. Bill has been chosen as an Ohio Super Lawyer in 2019. His experience includes substantial experience in zoning, land use, and environmental litigation, all types of transactional work, extensive planning and development plan implementation work, condominium creation and association representation, construction litigation, litigation involving condominiums and other planned communities, and litigation involving real estate contracts, titles and title insurance. Bill also represents many individuals, businesses, non-profit organizations and governmental bodies in general business, estate planning, business succession, and probate matters. He has represented and continues to represent many governmental bodies (primarily Townships), developers, churches, community and condominium associations and neighborhood groups. He also spends lots of his time as an active participant on the Legal Ethics and Bar Admission committees of the Columbus Bar Association. Bill is a member of the American, Ohio State, and Columbus Bar Associations. In late 2013, he was appointed to the Columbus Bar Association's Certified Legal Ethics Committee, and he regularly investigates, prosecutes, consults with and represents attorneys and other licensed professionals regarding ethics and professional licensure matters. Bill has represented the Bar as Bar Counsel on a number of admissions and ethics cases. 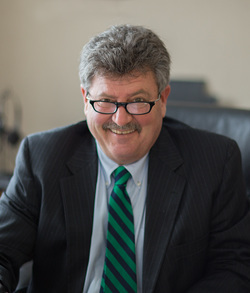 In addition to his work on the Ethics and Admission committees, Bill has been a member and participant in many other Columbus Bar Association committees and professional Committees, including the Common Pleas Court Committee, the Litigation Practice Institute Committee, the Real Property Committee, and the Construction Law Committee. He is also a member of the Columbus and Worthington, Ohio Estate Planning Councils; he is past President of the Joseph Fletcher Lawyer’s Ethics Conference, and he is an officer of the Lawyer's Club of Columbus. Bill was awarded The President’s Call to Service Volunteer Service Award, National Corporation for Volunteer and Community Service, in 2012. He was inducted into the Dublin High School District Hall of Fame (as a "community advocate") in 2015, and was a part of a football team inducted into the Dublin High School Athletic Hall of Fame years ago. Bill is proud of earning the rank of Eagle Scout, and is also a proud Sigma Chi. Bill serves as the President and Administrator of The Ross Foundation, Inc., a community service driven charitable foundation that focuses on making contributions to support full time undergraduate students in need of additional financial help, allowing them to attend and succeed at the colleges of their choice. The Foundation also supports a number of important local charities. Bill is an avid fisherman. He spent 18 years as an Amateur and High School Ice Hockey Referee, and is Past President of the Central Ohio Ice Hockey Referee Association. Bill is a die-hard Buckeye fan. Bill has been married to Susan Loveland since 1977 and they have two adult children, Megan Meyer, D.O., and Matt Loveland.